Carfilzomib, an irreversible proteasome inhibitor, is approved as a single agent and in combination with dexamethasone in the United States (US) for the treatment of relapsed/refractory and relapsed multiple myeloma (MM), respectively and in the US and Europe in combination with lenalidomide (LEN)/dexamethasone for the treatment of relapsed MM. The approved dose/schedule of carfilzomib is a twice-weekly, 10-min intravenous (IV) infusion on days 1, 2, 8, 9, 15, and 16 of a 28-day cycle (starting dose: 20mg/m2 [cycle 1: days 1 and 2], escalating to 27mg/m2 thereafter). 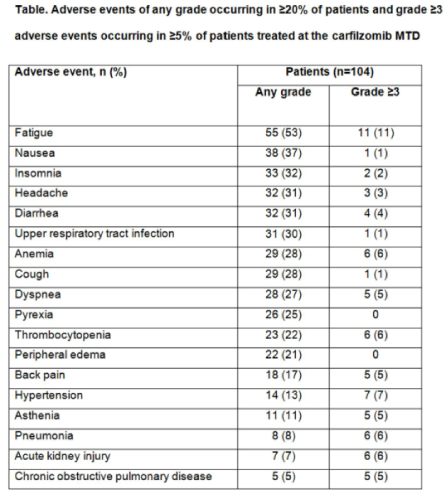 A phase 1/2 study (CHAMPION-1; NCT01677858) to determine the maximum tolerated dose (MTD) of carfilzomib (phase 1), the overall response rate (ORR [≥partial response]) (phase 2) and safety of once-weekly carfilzomib with dexamethasone (Cd) in patients with relapsed or refractory MM. Patients with relapsed or refractory MM (1−3 prior lines of therapy) received carfilzomib (30-min IV infusion) on days 1, 8, and 15 every 28 days. Phase 1: patients received carfilzomib 20mg/m2 on day 1 of cycle 1 followed by 45, 56, 70, or 88 mg/m2 beginning day 8 of cycle 1 in successive dose-level cohorts until the MTD was reached (using a standard 3+3 dose-escalation scheme). All patients received dexamethasone 40mg (IV or oral) days 1, 8, 15, and 22 (cycles 1–8); dexamethasone was omitted on day 22 cycles ≥9. Phase 2: patients received carfilzomib 20mg/m2 on cycle 1, day 1, escalating to the MTD for subsequent doses. Dexamethasone was given as previously. Cd was administered until unacceptable toxicity or disease progression. Blood samples were collected for pharmacokinetic and pharmacodynamic analyses. Once-weekly carfilzomib (70 mg/m2) with dexamethasone for patients with relapsed or refractory MM has an acceptable safety and tolerability profile with promising efficacy. The dose and schedule of carfilzomib used in this study (20/70mg/m2) is currently being compared with the regulatory-approved carfilzomib dose and schedule (20/27mg/m2 twice-weekly) in an ongoing phase 3, superiority study (ARROW; NCT02412878).